"This is a quickie dessert recipe I threw together for me and my significant other. 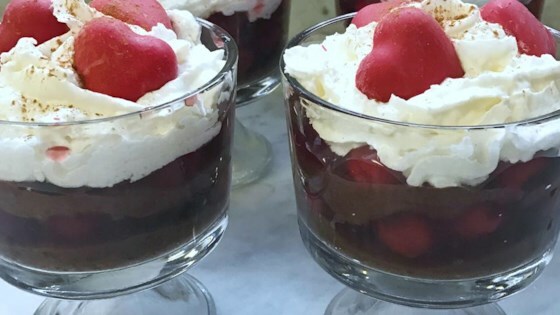 It looks good and tastes great, with alternating layers of chocolate pudding and cherries. The evaporated milk makes the pudding extra creamy." Pour the evaporated milk and dry pudding mix into a container with a lid, seal it, and shake for 45 seconds to combine. Let the pudding set for 5 minutes. In 2 large parfait glasses, alternate layers of chocolate pudding with layers of cherry pie filling. Top each glass with whipped topping, and sprinkle with cinnamon. Chill for 1 hour before serving. See how to make impressive, surprisingly easy cream puff swans. I didn't have instant pudding, so I cooked mine. But, it made a nice thick pudding with the evaporated milk. Yummy. Quick and easy. Made it as a Valentine dessert. Looked great was too sweet for our taste. This was really easy! I did it exactly as described and didn't have an issue with the cherries falling through the pudding layers.